I found this recipe quite a few years ago. I have made it many times since then. If you have read my blog long you know that I send a lot of treats to my husband’s office. But not only do I send treats to work, sometimes I send treats home with the staff members. I like to occasionally send things home for their families to enjoy. Several years ago we had a staff member who’s son was allergic to eggs. This made it hard to find cookies and other treats to bake for them. When I first saw this recipe I knew it would be perfect for this family, because it does not have eggs in it. And you don’t miss the eggs in this. They are really good. The other thing that I love about this recipe is the combination of chocolate and toffee. How can you go wrong combining those two things. Chocolate and toffee are one of my favorite things to combine. Directions: In a large bowl, combine flour, sugar, cocoa and baking soda. Whisk the water, oil, vinegar and vanilla until smooth. Gradually add to dry ingredients just until combined. Stir in toffee bits. Fill paper-lined muffin cups two-thirds full. Bake at 350° for 20-25 minutes or until a toothpick comes out clean. Cool for 10 minutes before removing from pans to wire racks to cool completely. For frosting, combine confectioners’ sugar and cocoa; set aside. In a large bowl, beat butter and 1/2 cup cocoa mixture until smooth. Add milk, vanilla and remaining cocoa mixture; beat until desired spreading consistency is reached. Stir in 3/4 cup toffee bits. Frost cupcakes. Cover and refrigerate until serving. This makes about 15 cupcakes. 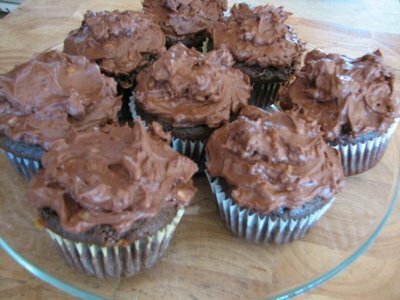 I love making cupcakes and these are right down my alley with all that chocolate and toffee. Thanks for the recipe. visiting from I am BD! Mmm, those look good! Thanks for sharing the recipe. These sound – and look – scrumptious! It is great to find recipes that you can make for people with special dietary needs. And what a great thing to do – send goodies with your husband to work and for his coworkers to take home. Very cool. Oh my gosh! These look so beautiful and they sound YUMMY! Wow, these look delicious !! Thanks for sharing,have a blessed day. The look fantastic, and no eggs! I bet you’re hubby’s office can’t wait for him to bring your treats in ! Think I gained a couple of pounds just reading the recipe! I am very much trying to get away from boxed mixes and these should be perfect to try! Hi Lynn… These look wonderfully delicious! Can’t wait to try them! Jsprik, I hope you enjoy them! .-= debora lewis´s last blog ..Taco Pasta =-.